Conoptics Laser Stabilization System (LASS-II) is designed to lower the noise intensity in laser beams. The LASS-II significantly enhances the signal to noise ratio of a laser over a broad bandwidth. Customized options are also available upon request. Conoptics Laser Stabilization System (LASS-II) is designed as an electro-optic feedback loop capable of reducing the amplitude variations commonly associated with lasers. The LASS-II system enhances the signal to noise ratio of the laser over a broad bandwidth. Both an internal and external reference input is provided, allowing analog programming of the laser throughput. 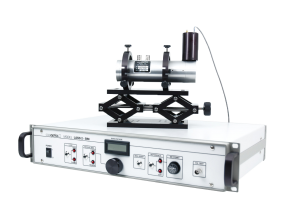 The LASS-II is particularly convenient for use in recording systems where laser power must be varied as a function of position on the recording medium (i.e. video disc, flat bed recorders, etc.). The system is composed of feedback electronics, power supply and electro-optic modulator with integrated beam-splitter and photodiode amplifier. Noise Floor 458nm, -100db Relative to F.S. D.C. Stability â€“ Short Term .1% Relative to Full Scale (@.5Imax, T=0 -> 1hr.